This is a very lovely printable winter image that I created from a beautiful Victorian scrap. The winter clip art makes for a perfect Christmas greeting, don't you think? I can imagine that the woman walking through the village is on her way to a neighbor's house, delivering some delicious, handmade goodies for Christmas. 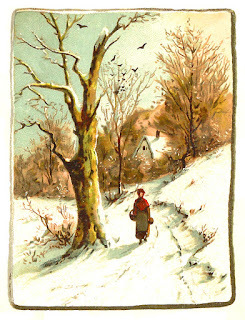 It's an idyllic, country scene that would make for a cherished Christmas card. I hope you enjoy this digital winter download for all your winter and Christmas projects! I've posted three, printable Christmas greetings on The Graphics Monarch with this digital winter clip art!